Although Miley’s lifestyle has come into question recently, there has been no doubt that she is an animal lover and completely devoted to her pets. 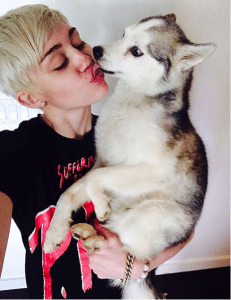 In addition to Floyd, Miley is also the mama to four other rescue dogs, Ziggy, Happy, Mary Jane, and Penny Lane. This recent loss seems to be taking a toll on Miley as she revealed, “I know I don’t mean it but I wish he would’ve taken me with him this is unbearable. What am I gonna do without him? I am miserable.” Along with the post, Miley shared a photo of Floyd licking her face. The former Disney star is in the middle of her worldwide Bangerz tour, and she took a moment to address her fans prior to the show, “I’m sorry in advance if I am not myself tomorrow Boston. I will try my best to be my best.” However, it appears that Miley did have Floyd on her mind during her performance. “I just wanna do a song for him. We used to always listen to Fleetwood Mac together, it’s his favorite song…so I wanna do this song for Floyd,” Miley shared with the crowd. The singer than performed a cover of Fleetwood Mac’s ‘Landslide’ at last night’s show in Floyd’s memory. The North American leg of her ‘Bangerz’ world tour will continue tonight at East Rutherford’s Izod Center tonight (April 3). Next month marks the beginning of the European leg of the tour, taking her to England. The tour’s first UK stop is London’s 02 Arena on May 6th.